New York, May 16th, 2018 - The School District of Somerville, MA received on May 30th 646 books for readers ages 0 to young adults. The collection will be an asset to different programs in various schools. Regina Bertholdo, director of the Parent Information Center, was present at the Prêmio PLH celebration (an award that highlights professionals and projects that work for the vitality of Portuguese as a Heritage Language around the world) on Friday, May 1st, at the General Consulate of Brazil in Boston, representing Somerville´s School District superintendent .The donation was part of the activities of the 5th edition of a conference for teachers of Portuguese as a Heritage Language (5a Conferência sobre o Ensino, Promoção e Manutenção do Português como Língua de Herança), event promoted by Brasil em Mente since 2014. The 2018 edition took place at the Massachusetts Institute of Technology in Cambridge, MA, between May 31st and June 3rd. Brasil em Mente is a cultural organization on a mission: to promote and encourage the teaching/learning and use of Portuguese as a Heritage Language within the descendants of immigrants. Since 2009 the organization has created many programs and resources that reached NYC, where the organization is officially located, and beyond. On May, 2011 BEM inaugurated a pioneer children’s library with a collection that had 2,000 volumes available to Portuguese speakers living in the metropolitan area of NYC. "The library was created to supplement parents and educators with authentic Brazilian/Portuguese reading material in order to improve the number of opportunities to insert Portuguese in the everyday life of heritage speakers. The challenge of choosing and purchasing good books was mentioned many times on interviews I did with parents who pointed those out to be impacting factors to the maintenance of Portuguese as a Heritage Language in their homes", explains Felicia Jennings-Winterle, founder of Brasil em Mente. 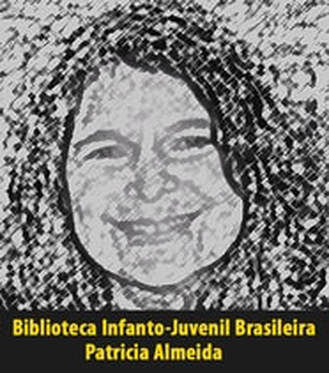 The library was named after Patricia Almeida, a public server from Itamaraty (the Foreign Affairs Ministry of Brazil) who worked as vice-consul at the General Consulate of Brazil in New York from 2009-2012. On her first year there she created the Project Brasileirinhos (Little Brazilians), in which children of Brazilian citizens came to the Consulate once a month to play, sing and make friends in Portuguese. According to the vice-consul, when she started working at the consulate, she noticed that Brazilian parents were speaking to their children in english on the waiting rooms. She believed that, by inviting the community to meet at the consulate, families would motivate each other to keep their origin language and culture. "Children should be exposed to Portuguese at an early age, before they went to school, and the language should be associated to fun and interesting activities", says the mother of three multilingual children herself. ​"We started opening the library on Sunday mornings. A very small number of families came a few times. We decided then to facilitate the process and created a program that sent books over the mail. That way, dealing with parking, traffic and the distance from home would no longer be impediments", continued the founder. For 5 years the program utilized Media Mail, a USPS service that enabled books to be sent to all 50 American states for a fixed low rate. Despite the practical nature of the program and the fact that the collection was constantly growing from generous donations of publishers, authors, illustrators and families with grown-up children, the program had a rather small number of members. Various announcements were made showing the benefits of reading/writing on two languages, that the collection was catered to the specific needs of heritage speakers, that it was cheaper to pay the US$25 monthly fee and get 12 books than buying 144 in Brazil, and that space and storage would no longer be issues –it just was not enough. "The books started getting too dusty and in my heart I could feel that the brightness of that treasure, which now shared space with me in my home, was fading. I realized that if the readers did not come to the books, the books had to departure and get where many could enjoy them, all at once. Somerville seemed like the perfect place for that since the first time I visited it." Portuguese is one of the most expressive languages in Somerville, a town located about 20 minutes away from Boston. ​Not only does the city breath various cultures and languages, it also celebrates its essential diversity. Adriana Fernandes, specialist in community engagement and employee at the Somerville Mayor's Office, says that at least 500 of the students in Somerville identify themselves as native speakers of Portuguese. But she remarks that such number could be much higher. "When dealing with statistics of undocumented immigrants, there is always a margin of error due to the fear of identification to the authorities. Still, one can say that 54% of the students in Somerville come from homes in which English is not their first language." "As the one who dreamed about every aspect of the library, I feel sad. I wish I could have cultivated it myself. But I have realized that passing it to a more resourceful instance does not mean I am giving up on my dream. In fact, it means that it will continue and flourish. As I think of it, the image of a beautiful tree blooming with delicate flowers on a spring morning comes to mind. I am honored to offer Somerville with such a cherished treasure", says Felicia. NEW YORK, May 18th, 2018 - May is a busy month, full of news and activities at Brasil em Mente. In addition to the celebrations of The Day of Portuguese as a Heritage Language on May 16th, it also promotes the World Conference about Teaching, Promotion and Nurturing of PHL (an annual event done since 2014), as well as a Book Fair and the PHL Awards. The purpose of the PHL Awards is to acknowledge projects and individuals, rather than rank them, as well as demonstraste the variety of actions that have been developed in various and varied contexts for the teaching/learning Portuguese as a Heritage Language. To learn more, see here. For the first time the general public was invited to participate in the process of recommendation and voting for the recipients in the of INITIATIVE, PROJECT and EDUCATOR. While getting recommendations from all corners of the world, Brasil em Mente was able to get to know and spread the word about actions of both Brazilian and Portuguese educators established for a while, in fact. As it has been done since 2015, the recipients of the forth category of the award, the one that acknowledges the work of authors, professors and researchers, was chosen by the directive board of Brasil em Mente. AMBASSADOR: Clémence Joüet-Pastré, PHD (Harvard University), Silvia Melo-Pfeifer, PHD (Universität Hamburg), Glaucia V. Silva, PHD (UMass Dartmouth), Ambassador Glivânia de Oliveira (General Consulate of Brasil in Boston). PHL Award's cerimony will take place at the General Consulate of Brasil in Boston on an invitation-only event. During the cerimony, the city of Somerville will offer a show with poems of the Brazilian authors João Cabral de Melo Neto and Manoel de Barros, with music composed by Nando Michelin and Edinho Cardoso, and the singer Mirella Costa as a special appearance. ​New York, May 13, 2018 - Cassiana da Silva Joaquim, a Brazilian expat, will release her first book, We need to talk, next Wednesday, May 16th, day in which Portuguese as a Heritage Language is celebrated around the world. The bilingual book is published by Brasil em Mente in Portuguese, in both variants Brazilian and European, and other 5 languages: English, French, Spanish, Italian and German. It will be sold on Amazon, on printed and Kindle versions. The author presents the perspective of a bicultural child as she develops an informal dialogue with her parents stressing the importance of mutual respect, value to all cultures involved in the family and the advantages of growing up speaking more than one language both on school years and, later, when as an adult working in such globalized world. ​According to Cassiana, bilingualism (especially the one that involves a family Heritage) has been seen for many years as a under the bed scary monster, bringing fear, hesitation and miss information to many families, schools and even health and education professionals. "The main message I want to share with the book is that adopting a bilingual life style is very rewarding, though not easy. Everybody wins: the couple, the extended families, the community, but mostly the children. We need to talk (entitled Dedinho de Prosa, in Portuguese) offers a daily exercise of love, respect, persistence and consistency." Cassiana da Silva Joaquim is from Rio de Janeiro, holds a degree in Social Communication and is the Executive Director of the cultural organization Brasil em Mente in Europe. She coordinates a playgroup of Portuguese as a Heritage Language and co-manages a group on social media for Brazilian moms living abroad. She is married to an Italian national, Marco, and is the mother of Nina. Brasil em Mente Publisher, an extension of the cultural organization with the same name, develops specific resources to Portuguese speakers' communities that live outside of their countries of origin and wishes to bestow the wholeness of their cultural identities. 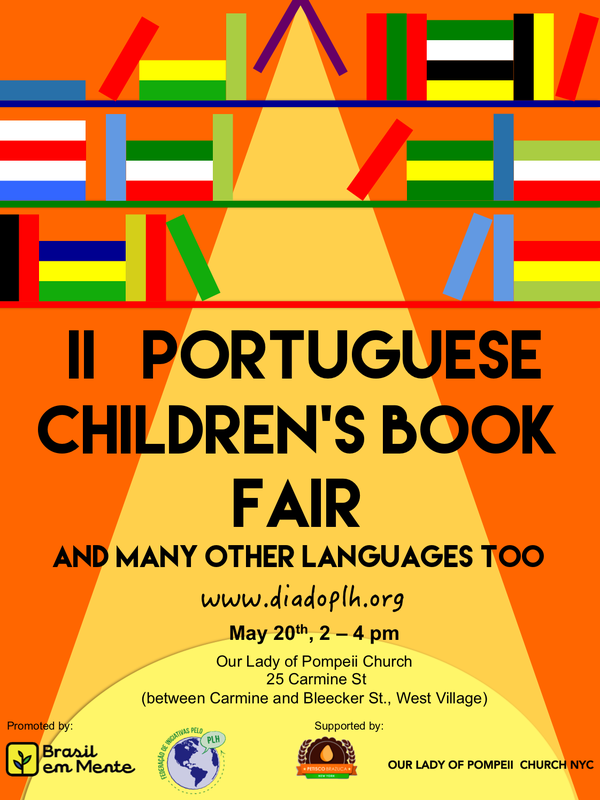 New York City, May 2, 2017 – Brasil em Mente proudly invites you to the II Portuguese Language Children and Teens’ Book Fair, which will take place during the IV Conference on Portuguese as a Heritage Language, an event to discuss this type of Portuguese teaching. The 4th edition of the event, which attracts visitors from all over the world, features the book fair, open to both the attendants of the Conference and the public at large. This year lauded children’s book author Ilan Brenman will be featured. He has bestselling records in Brazil as well as several other countries, not to mention countless awards. His works have been translated from Portuguese to German, French, Italian, European Portuguese, Swedish, Danish, Spanish, Catalan, Valencian, Polish, Korean, Chinese, Basque, and Galician. Cultural researchers Maristela Loureiro and Ana Tatit, also speakers at the Conference, will bring the Brinco e Canto Collection – 4 volumes published by Melhoramentos and filled to the brim with the culture of children. We will also feature expatriate writers and illustrators Ana Cristina Gluck, Marcia Misawa, Joana Penna, and Felicia Jennings-Winterle. Editora Projeto, a traditional Brazilian publishing house, will also be present. Authors will not only show their work but also tell stories and interact with readers of all ages. The event was made possible with the invaluable support from Ricardo Rosa, from Petisco Brazuca, who introduced us to wonderful, helpful people. Cleusa Aparecida Paula, who is part of the Brazilian community of the Lady of Pompeii Church, Walter Tonelotto, church custodian, and priests Leonir Chiarello and Mario José Zambiase, made our book fair happen. This is further proof that promoting Brazilian culture and the Portuguese language is (almost exclusively) accomplished by civilian organizations. Counting on such support pleases us more than carrying out our event. How much? $5 (per person) or $12 (per family). Cash only at entrance. Purchases can be made with cash or credit card. New York, November 28th - Since 2014, Brasil Em Mente offers with exclusivity an online continuing education program, through which more than 120 educators from 18 countries have learned. Awarded in 2016 by AOTP (American Organization of Teachers of Portuguese) brings in 2017 a new format: now we will have 3 volumes in our program, in a total of 51 weeks of discussion, production and (re)formation. With the subject of work for 2016/17 practice, preparing, priorities, professionalization: PLH throughout the world, Brasil em Mente hopes to bring forth the many individuals that are involved in educative practices in this modality of the Portuguese language to study, exchanges, and research. There is a rapid growth on the number of initiatives that projects that promote PHL throughout the world. There is also lack of appropriated materials and within reach of these educators. As part of an engaged group, these educators need to promote community encounters allowing the families to socialize, but, in addition, need to demonstrate concretely the benefits of such a particular bilingualism. This one involves a Heritage Language and demonstrates the importance of socioemotional aspects and the relevance of the academic career of children and teenagers, in the present and in the future. Consult the course page to understand the proposal of each volume. If you participated in one of the groups in volume 1 (groups 1-6) or volume 2 (groups 1 and 2), get in contact with the coordinator to for an enhancement program, in which you benefit yourself from the additions made after the participation. ​New York, 5th of november - It all started at the end of 2013. Brasil em Mente created an education program for educators of PLH, with the support of the Brazilian Consulate of NY. The end of the 9 weeks of the program would be 4 days of discussion in the world's greatest city. Four years later, here we are, arranging the fourth event. From the 17th to the 20th of May, educators, illustrators, researchers, authors, and parents that wish to keep their mother tongue alive will reunite in New York for a bold programming. For more information, visit this page. Lastly, BEM invites you to participate in the third event of LINCOOL- the electronic magazine of the PLH. Visit the publication page here. New york, October 22nd - The Jabuti Award is the most traditional and prestigious award of Brazilian literature. 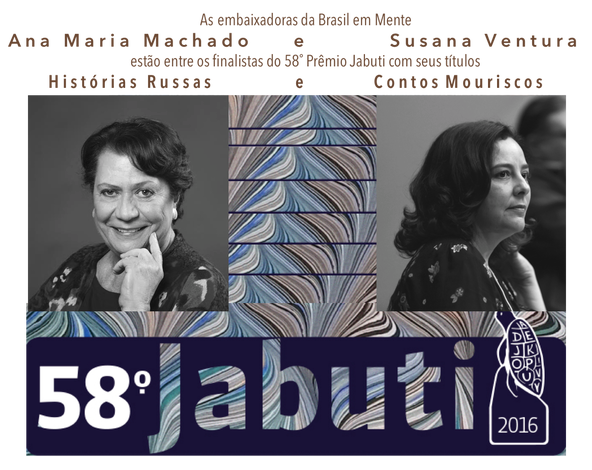 Ana Maria Machado and Susana Ventura, big authors and ambassadors of the Brasil em Mente organization, have titles within the finalists of the 58th edition of the award in the category "adaptation". 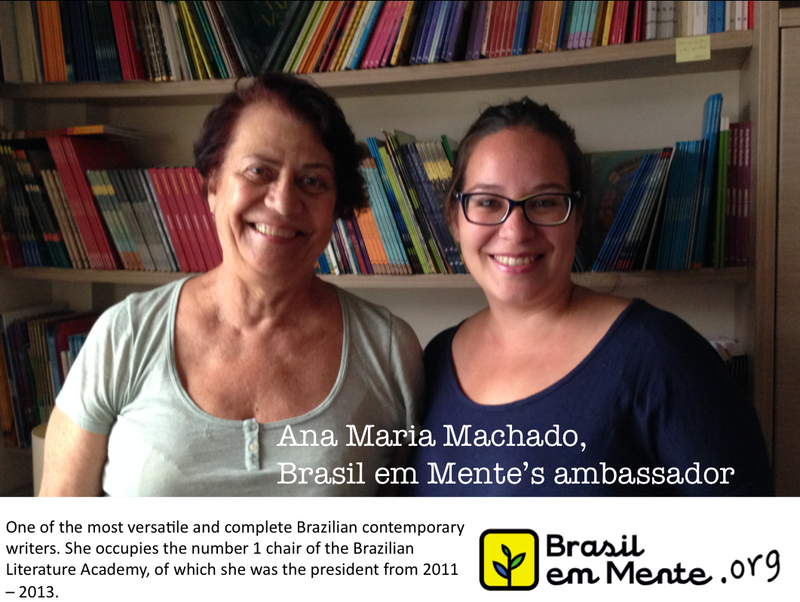 Former president of the Brazilian academy of letters, in 2015, Ana Maria Machado was the main spokesperson for the 2nd Conference of Teaching, Promotion, and Maintenance of the PHL. In 2016, was the first time for Susana Ventura, also a literary critic and an expert in Brazilian Literature. Check out the finalists here. The awarding ceremony will be on November 24th. New York, 19th of may 2016 - Brasil em Mente, a cultural organization, world reference in the study and promotion of bilingualism and Portuguese as a Heritage Language, promoted between 12 and 15th of May the 3rd edition of the Conference about Teaching, Promoting, and Nurturing of the PHL (3CPHL). Especifically focusing in thediscussion of this modality of teaching Portuguese language, the event took place at NYU and received 45 participants, educators, researchers, authors, cultural promoters, and representatives of the Brazilian government and of the Department of Education of NY. The theme of the conference was based on a question: What are the heritages of this heritage? Since September of 2015, BEM invited its audience to make a cultural reflection - what are the components of this so called Brazilian heritage? - and a personal one - What are my heritages? And what are my family's? The participants discussed matters about identity, immigration, Native Brazilian and African Heritages in Brazilian literature and culture and the necessity of nurturing oral traditions. Besides the international guests Susana Ventura (literary critic and author) and Daniel Munduruku (author and educational activist), Roberta Asse and Nereide Santa Rosa, we had the presence of the author Yara Maura Silva, resident in NY. Panels, workshops, and lectures composed the program of the 3CPHL that also held a Children’s book fair - an event open to the community and that brought the works of over 15 Brazilian and foreign authors. The PHL award was celebrated and delivered to Susana Ventura (BRA), to author and activist Daniel Munduruku (BRA) [ambassador category], to à Estrelinha e.V. (GER), to Vamos Falar Português (US) [school category], to project Dona Terra (whole world) and the project Praticutucá (US) [projects category]. The selection process for choosing the winners has three steps: observation, indication, and voting. The members of Brasil Em Mente’s executive board do these actios. The event was closed in great style with guided visit to the Ellis Island Museum of Immigration, an offering from the museum itself. New York, March 21st, 2016 - Brasil em Mente has the pleasure to invite you to the Children and Teenager's Portuguese Book Fair that will happen during the 3rd Conference of Portuguese as a Heritage Language, an event promoted specifically for the discussion of this aspect of Portuguese Language teaching. New York, January 8th – Brasil em Mente begins 2016 by announcing more details about the III Conferência sobre o Ensino, Promoção e Manutenção do PLH. It is with great pleasure that we announce acceptance of the author Susana Ventura as the keynote speaker. University professor, literary critic, author and curator of initiatives in the area of books and literature, Susana has a doctorate in Comparative Studies of Literature of the Portuguese Language from the Universidade de São Paulo. The wide body of Ventura’s work is heavily referenced in the countries that speak the Portuguese language. A researcher associated with the Centro de Estudos de Literaturas Lusófonas e Europeias da Universidade de Lisboa – CLEPUL, and since 2010, also with the Centro de Pesquisas Interdisciplinares about the Mundos Ibéricos Contemporâneos - CRIMIC – Sorbonne, Paris IV, as well as a member of the Comitê Editorial da Machado de Assis Magazine – Literatura Brasileira em Tradução, da Biblioteca Nacional e Itaú Cultural since 2011, Susana writes in and about the Portuguese language. Our special guest is the face of the theme of the 3rd annual CPLH - What are the heritages of your heritage? This question, which will be the theme of PHL in 2016, is answered again and again in the work of those who consider themselves “more reader than writer, more researcher than teacher” and who will certainly inspire educators and researchers around the world who are dedicated to Portuguese as a Heritage Language. I am more reader than writer, more researcher than teacher. The stage on which I am standing is of research, for a new collection of books that will start to materialize in the second semester of 2016. For me, it is a very interesting phase, because I need to read, discover, think, and select. Books and rehearsals and files that were collected in the last 2 years and friends collected for me in various countries. Surprises in 4 different languages, that will be unveiled, annotated, and organized. The worktable shows the sloppy mapping, with piles of tidy books – for now – for the language in which they are written. But another organization has already started: lists of animals, lists of places, maps, lists of themes… A madness that soon will begin to make the dream possible. There is possibly no one who enjoys the work more than I do! New York, December 8th, 2015 – Brasil em Mente closes the year 2015 with two publications created specifically for the context of Portuguese as a Heritage Language (PHL). Para Brasileirinhos is a didactic guide about the collection Brasileirinhos, authored by Lalau and Laurabeatriz (published in Brazil by Cosac Naify), so that educators can use this work well beyond just reading it. With a pedagogical approach focused on the uniqueness of a heritage language, the guide presents activities for various ages and levels of proficiency. Felicia Jennings-Winterle, an educator who has been dedicated to the research and practice of PHL since 2009, did the development of this guide. Another new release is the electronic magazine LINCOOL. Focused on the research and discussions about PHL, LINCOOL – Language and Culture – intends to be a space for publications with a more academic tone than those on Plataforma Brasileirinhos, which regularly has 5,000 daily views. With the curatorship of researcher and doctoral candidate Andreia Moroni, the main objective of the magazine is to incentivize research, discussion, and production of material specifically related to this incipient and passionate area of study. Therefore, LINCOOL will be somewhat (in)formal and democratic for sharing studies and research with a more academic tone about the universe of Portuguese as a Heritage Language. Learn how to send your work here. LINCOOL will be published quarterly, with the inaugural edition being released in December of 2015. New York, July 11th, 2015 – The publisher Brasil em Mente has the honor of announcing the release of one of its works in São Paulo, at the prestigious Casa Das Rosas (Avenida Paulista 37). The book Português como Língua de Herança: a filosofia do começo, meio e fim (Portuguese as a Heritage Language: The Philosophy of Beginning, Middle, and End), released in May in NY, written by 14 women who develop different projects and research, synthesizes the panorama of this culture-language around the world in 300 pages of excellent content. The publication presents and discusses an old, but at the same time, new concept – Portuguese as a Heritage Language. Old because the Brazilian diaspora has a complex and long history, with a number of scenarios in which the Portuguese language and the Brazilian culture were, and still are, in some way, part of the lives of children and grandchildren of immigrants. New because, recently, communities of the Portuguese language, especially the Brazilian, have professionalized and participated gradually more and more in the discussions about Heritage Languages. It is now necessary to connect past and recent experiences in order to celebrate and bring awareness to parents and teachers of this linguistic specialty. Brasil em Mente opens the 4th iteration of the course for teachers and others involved in Portuguese as a Heritage Language. New York, June 1st, 2015 - Registration is now open for the 4th edition of the course that BEM has offered since 2014, and has created a second volume for the program. This initiative illustrates one of the strongest missions of the organizations - to offer tools, space and actions that professionalize this linguistic specialty. Portuguese as a Heritage Language, as a minority language, is taught around the world by individuals who do not necessarily have formal training in education or who do not feel totally prepared to develop a pedagogical program. With the aim to strengthen and develop skills, the program has 15 weeks of readings, video classes, and online debates addressing basic questions, both educational and in relation to this culture-language. The first volume - PHL: a philosophy of beginning, middle, and end is a prerequisite for the second volume - Literacy in a Heritage Language. Registration is open and there is a discount of $100 for those who enrolled before July 10th. Learn more, here. 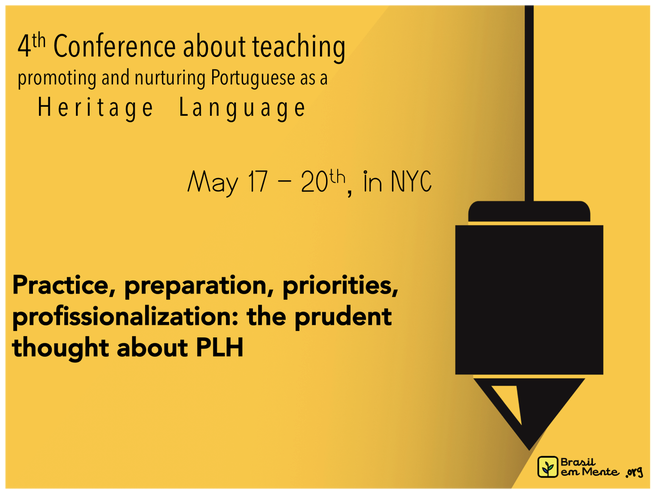 New York, NY May 19th, 2015 - Brasil em Mente promoted the II Annual Conference abou the teaching, nurture and promotion of Portuguese as a Heritage Language. This year, the organization counted on the institutional support of CLACS (Center of Latin American and Caribbean Studies) at New York University and from the Brazilian Literature Academy (Academia Brasileira de Letras). The event had 45 participants enrolled from 10 countries, where they teach and research this linguistic specialty. The author Ana Maria Machado, former president of the Academia Brasileira de Letras and ambassador of Brasil em Mente, was the key speaker. Her speech entitled "Em casa na minha língua" (At home in my language) was broadcasted live through the web and can be watched here. Another highlight was the release of a pioneering publication. The book Português como Língua de Herança: A filosofia do começo, meio e fim (Portuguese as a Heritage Language: the philosophy of beginning, middle and end) was written by 14 women who have been developing actions for many years, and synthesizes 300 pages of excelente content discussing how the scenario of this language-culture around the world. 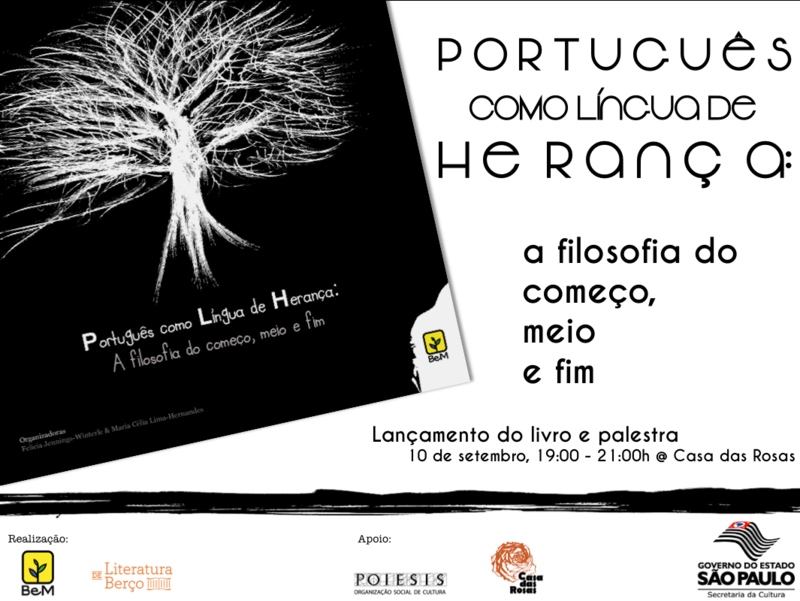 Both the conference and the book release are part of the celebrations of the Day of Portuguese as a Heritage Language. Three prizes of recognition were delivered. The author Ana Maria Machado got the special prize as an ambassador for the movement towards Portuguese as a Heritage Language, prof. Luzia Tanaka from Japan earned the prize for her dedication to the teaching of PLH and the initiative ABCD (Association for Brazilian Bilingual Children's Development) for the development of educational programs in Australia. The next edition already has a date and a theme - the heritages of this heritage. Soon, information will be available on how to enroll and apply to present various proposals. New York, Feb. 24th, 2015 - Brasil em Mente has the honor of announcing that the conference titled Theory and Practice, Side by Side will be held at NYU with the institutional support of CLACS (Center for Latin American and Caribbean Studies) which will host the event. The conference is dedicated to the promotion of discussions and networking among educators, researchers and others involved with Portuguese as a Heritage Language and will take place this May 14-17. Join us! Learn more here. 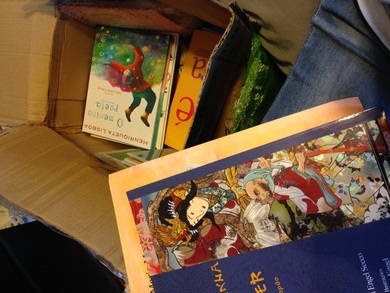 New York, Feb. 11th, 2015 - The Children's Library Patricia Almeida has received more than 120 kilos of books donated by Editora Peirópolis (BEM's ambassador), Editora Melhoramentos, Editora Carochinha, the authors Ana Maria Machado (BEM's ambassador), Lalau and Laurabeatriz (BEM's ambassadors), Mariana Caltabiano, Susana Ventura, Patricia Engel Secco, Hélio Ziskindi and Fortuna. Thanks to them the collection has grown, to the benefit of the program that sends books via the mail to all states in the US for an accessible price. Are you already a member of this program? No? Learn more here. New York, January 16th, 2015 - Brasil em Mente and other cultural initiatives will commemorate the Day of Portuguese as a Heritage Language on May 16th. As part of the commemoration of this day, Brasil em Mente releases the book PHL: The Philosophy of Beginning, Middle, and End, the same name as the philosophy of Brasil em Mente's founder, Felicia Jennings-Winterle, which will serve as the introduction for this book. Twelve chapters document the practices and research of the most prominent individuals in this field, including 2 participants of the first class of Programa de Formação para Professores e Demais Envolvidos com o PLH. Our aim for this book is to be used for cultural promotors, teachers, students and for those who establish linguistic and cultural policies that have a Brazilian community-based view abroad. The organization of the book was done by Felicia Jennings-Winterle, coordination by Maria Célia Lima-Hernandes (USP, Brazil) and Luciana Lessa (Georgia State University, USA), and edited by Andréia Moroni (APBD, Espanha). The other authors are Carine de Oliveira Rocha, Karina Viana Ciocchi-Sassi, Cássia Viana-Bittens, Patricia Fincatti, Ivian Destro Boruchowski, Andréa Menescal Heath, Ana Lucia Lico, Glaucia Silva, and Claudia Storvik. Event: Release of the Book PHL: The Philosophy of Beginning, Middle, and End on May 15th, 2015. "Our admiration for your work is not just due of the richness with which it is developed, but also because of the history of your life. Because of your experience in exile, you see the importance of maintaining the inheritances of language and culture, which constantly meets the goal of our work to not only promote, but also to nurture the very intrinsic issues expatriates face." 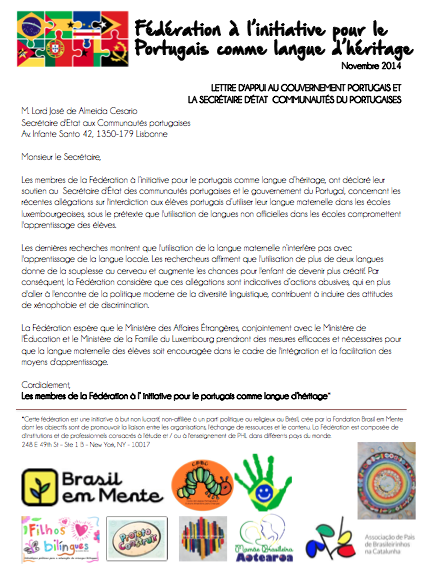 The Federation of PLH Initiatives wrote a letter in support to the European entities in response to the prohibition of the use of the Portuguese language in Luxembourg. New York, November 10th, 2014 – The Federation of PLH Initiatives is an initiative of the cultural organization Brasil em Mente, both non-profit and with the objective to promote the exchange of resources and content, as well as networking within the organizations that promote Portuguese as a Heritage Language. This federation has the participation of representatives of the diverse community groups, pedagogical initiatives, and dedicated professionals to study and/or teach PLH in various countries around the world. 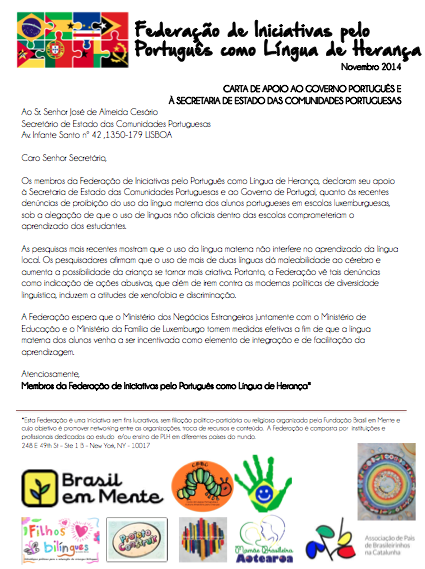 In light of the complaints that were made in the European media about Portuguese children living in Luxembourg being forbidden to communicate in their mother language, members of the Federation wrote a letter in support of the Portuguese government and the Secretary of State of the Portuguese Communities which defends the importance of maintaining the mother language and the social, emotional, and cognitive benefits of this process. New York, November 3rd, 2014 – Brasil em Mente and various promotors of Portuguese as a Heritage Language from around the world will commemorate The Day of Portuguese as a Heritage Language, for the second time on May 16th, 2015. The objective of the creation of a day to commemorate PLH is to celebrate this specialty and the diverse initiatives of those who disseminate concepts and practices for professionals who work with PLH. These educators face challenges of understanding and putting into practice the teaching of a culture-language and deal with so many complex variables of the communities to which they belong. We are searching for partners who want to show their support for this event, which is very important to the community. If you would like to support structurally, institutionally, financially, or really join forces and schedule an event in your community, please get in touch with us. Event: Day of Portuguese as a Heritage Language - May 16th, 2015. Brasil em Mente is a cultural/educational non-profit organization which maintains various pioneering initiatives which promote and nurture the Portuguese language and the Brazilian culture in the United States and beyond.